Technology and digital devices such as computers, smartphones and tablets offer a world of possibilities to connect to others and gather information. They have become an important part of our daily lives. It has also become common to see a toddler play on a parents’ phone, or for young children to spend time on a tablet or computer at some point during their week. The entertainment and interactivity that digital devices offer to young children is the very reason why it is so appealing to them. This is, however very different to what a typical childhood entailed a few decades ago. With this in mind, it may be useful to consider how this may be shaping children during their early years. This has become the focus for many parents and professionals alike. How is technology influencing childhood itself? Is technology advantageous or detrimental to children? How do we help a child make sense of the mass of information available to them? Is there a specific amount of screen time that is ideal per day given a child’s age? This blog article offers a glimpse into the debates around the pros and cons of children’s use of technology, and includes some information from recent research on the topic. It is well known that childhood is marked by many developmental changes; physical, language, social, cognitive and fine and gross motor changes. This is often measured through the achievement of certain developmental milestones in these areas, relative to a child’s age. Professionals, caregivers and parents have wondered whether the presence of technology in children’s lives hinder the attainment of these developmental milestones, or if it may in certain cases offer a new means to stimulate growth and help children with learning and skills acquisition. The benefits of interaction with technology by children have been advocated for by Ryan and Deci (2000) in educational psychology research. The authors state that a child’s intrinsic motivation is stimulated when they interact with digital learning, where they can demonstrate mastery over tasks, copy their parents’ interactions with digital devices, and gain a sense of achievement. The accomplishment of these developmental tasks, such as gained self-esteem and competence (feeling mastery over a task), social relatedness and an increase in a sense of autonomy (a feeling of being in control through making rational choices) can benefit children in many ways. Furthermore, by engaging in digital activities which offer enjoyment for the child, their capacity for perseverance and task management is also improved (FutureLearn, 2016). The attractiveness of touch-screen technology means that children as young as 3 can now interact with digital devices. Holloway, Green and Livingston (2013) has noted a remarkable increase in very young children (such as pre-schoolers) making use of smartphones or tablets to access the internet. Furthermore, current research figures published in the UK state that a third of all children own their own tablet (Jütte et al., 2014). These figures seem to rise as the child’s age increases, with research estimating that 65% of children aged between 12-15 years will own a digital device (Jütte et al., 2014). Children aged between 3-4 years seem to be using the internet mostly for watching video clips (Holloway et al., 2013), especially on Youtube, or for playing games (Holloway et al., 2013); while slightly older children use the internet to gather information, particularly to complete homework, or to connect with others and socialise (Holloway et al., 2013; Ofcom, 2014). These figures are not yet researched in South Africa, but similar trends in technology are becoming more common. For slightly older children, it is important to help children acquire knowledge about the dangers of the internet. Parents will need to keep up to date about digital devices, the internet and trends emerging amongst young children. Most importantly, parents also need to be involved with their child, know which social platforms they are engaged in, and offer guidance about social-digital manners and the risks of sharing personal information with others. Certain internet companies are selling software which can assist to block sites which are known to have harmful content, but this is only a precaution. Children still need to be educated about the dangers of sharing personal information on social sites which seem harmless, as well as how to communicate well with others on such platforms. As these figures start to inform us of the way in which childhood is being shaped by digital technology, it is perhaps noteworthy to consider how children can be guided in interacting with technology in ways that first and foremost provide safety, whilst also stimulating their development. According to Helen King from the Child Exploitation and Online Protection Centre (UK), the most radical influence that the internet has had on children in the past decade concerns their social wellbeing. Children are able to access others and communicate with them in a virtual space which is outside of the real here-and-now world (Frostup, 2016). Livingstone , Görzig and Ólafsson (2011) states in their article titled Disadvantaged Children and Online Risk that it is the immature social skills which puts children at great risk when it comes to internet use. Furthermore, with as many as 37% of children aged 9-16 stating that they are more knowledgeable about the internet than their parents (Holloway et al., 2013), awareness needs to be raised with caretakers about children’s digital engagement. Perhaps the question that adults need to keep in mind is “How do we raise digital children?” On a TEDTalk by Sonia Livingston, a few experts have voiced their guideline regarding this. Julia Johnson, a child, adolescent and family psychotherapist, has mentioned that for children under the age of four, interaction on a digital device should be accompanied by an adult, entail activities that are done together, such as playing games or reading a digital book, and that the child should not be left alone with the device as a form of solitary entertainment. Furthermore, the American Academy of Paediatrics has stated that a child under the age of two should not have significant screen time at all, whilst children over the age of two should not have more than two hours a day. This is however merely a guide, and other factors, such as the parents attitude towards learning, the child’s developmental capacity and the types of activities engaged in should also be considered. Lastly, Professor Tanya Byron, consultant, clinical psychologist in child and adolescent mental health, reminds parents that what we know about the impact of technology on the child’s developing mind, particularly neurological impacts, is not yet well researched; however, what we do know is that children require a more diverse range of life experiences over and above mere digital learning. Children need to grow in areas such as fine and gross motor movement, sociability in groups and on a one-to-one basis, discover textures and sounds in the world, and learn about their own creativity. As such, one cannot go wrong by encouraging children to spend time outdoors, to play, socialise and learn in more traditional ways. Holloway, D. Green, L. & Livingstone, S. (2013). Zero to Eight: Young Children and their Internet Use, LSE, London and EU Kids Online, pp. 10–13. Jütte, S., Bentley, H., Miller, P. and Jetha, N. (2014). How Safe Are Our Children? 2014, National Society for the Prevention of Cruelty to Children (NSPCC), London, England. Livingstone, S., Görzig, A. and Ólafsson, K. (2011. Disadvantaged Children and Online Risk [online]. Available at http://eprints.lse.ac.uk/39385/ (accessed 9 March 2015). Ryan, R.M. and Deci, E.L. (2000). ‘Intrinsic and extrinsic motivations: classic definitions and new directions’, Contemporary Educational Psychology, vol. 25, no. 1, pp. 54–67. People are encouraged to express their love to their significant other on the 14th of February. Gestures are bold and moving, with an extra effort to make the other feel loved, desired and appreciated. Red roses are bought in their dozens, accompanied with chocolates and heart felt card messages; all in the spirit of an open and honest expression of love. Love – what a warm feeling it gives us. It offers us a feeling of affirmation that we matter and are cared for. When we think of love, often it is often associated with romantic love, as is demonstrated on Valentine’s Day. If we are to go back to early development and infancy however, the love between a baby and parent is what teaches us about love. This early relationship models something about the way we ought to love and of course how we might be receptive to love and how we react to it. This kind of love, between a parent and a baby, has a huge influence on our future selves. The internet is laden with love tests bearing titles such as “How deep is your love quiz”. It seems so simplified, rationalised and easily accessible. Perhaps this goes to show how people have a desire to love ‘right’ and to be loved ‘right’. Psychologists and researchers have proposed a number of different theories of love. To define love, however, for many is quite difficult. For children, however, it seems a little more straight forward. A group of professionals posed this question to a group of 4 to 8 year-olds, “What does love mean?” The answers they got were broader and deeper than anyone could have imagined (www.rogerknapp.com/inspire/childslove.htm). Upon reading that, it sounds like such a sweet and thoughtful comment for a four year old to make, and perhaps it has an even deeper meaning and speaks of the importance of one of the key elements of attachment in infancy. Attachment is a deep and enduring emotional bond that connects one person to another across time and space. One of the most important tenets of attachment theory is that an infant needs to develop a relationship with at least one primary caregiver for the child’s successful social and emotional development. 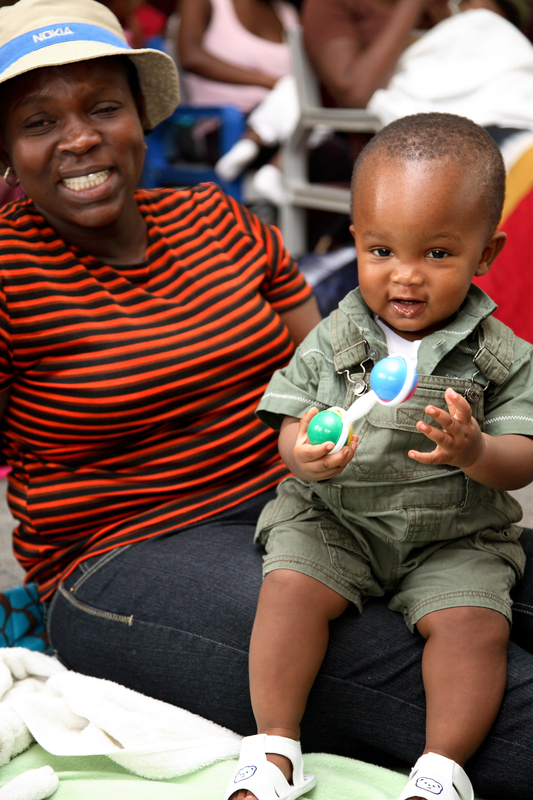 In the presence of a sensitive and responsive caregiver, the infant will use the caregiver as a safe base. When a child feels emotionally safe in their relationship with the person they most depend on for survival and affection, the child will have a good chance of growing up to be an emotionally healthy and balanced individual, who is likely to form deep and long lasting attachments to others and also feel strong and secure within themselves. This forms part of the foundation for the ability to love oneself and to love the other. The above extract speaks of the many situations that make children feel scared, alone and in need of reassurance. In those challenging moments, children seek affirmation, encouragement and comfort. Giving that is a sign of love to children. The little boy who made the effort to go and sit on his neighbour’s lap who had suffered a deep loss saw and perhaps had felt the value of just being with someone, being attentive and showing empathy. It was an expression of love. To love and show love has a lot to do with creating a relationship in which feelings can be shared. Being with isn’t a technique but perhaps a state of mind or an underlying attitude of empathy for the other. This is both important and difficult when intense emotions arise. Even though the little boy was unable to change the external situation for the grieving man, he was able to be with him in those moments, and just simply offer his presence. So in this ‘month of love’, Ububele encourages you to perhaps start to look at love simply, in an uncomplicated way by offering ourselves, offering safety, encouragement and presence. It may cost us less and mean more to others than a dozen red roses! 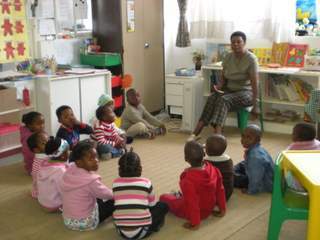 On Wednesday 13th January, Ububele’s Pre School was a hive of activity as 50 young children arrived to begin the new school year. Most of the children were excited and enthusiastic to be back after the December holiday but a few new children needed a little more reassurance before settling. For a young child, adjusting to a new school often takes a while. Even moving to a new class means facing increased academic demands, a new teacher and a changing social circle. It may help prepare your child for the year ahead if you mark school days on a special calendar. That way your child will have a sense of when school begins and which days they will be going. If your child is a little nervous, explain what to expect. Give him as many details as you can about what happens during a typical day. For example, children draw and paint, play outside, sing, and look at books. Be positive, but also warn them gently that they may get tired or find certain things difficult. If they have any problems or feel sad encourage them to tell their teacher or their parent when they return home. Most children get used to staying up late over the long December holidays. However, children need about 9 ½ to 11 hours of sleep a night, depending on their age. A child who is tired will be more prone to frustration, stress and tantrums. Getting them back on schedule so they’re sound asleep by 8pm to be up at 6am for school takes a couple of days of gradually moving the bedtime earlier. It is not a good idea to impose an early bedtime the night before school starts, as this may increase anxieties in both children and parents. Try to wake up a little earlier to arrive at school so you have enough time for meaningful goodbyes. Oh, and don’t forget that special ‘First Day of School’ photograph before leaving home! Children like what is predictable, because it makes them feel safe and they may feel anxious if they do not know what to expect. Try and visit the school before school begins so that your child is already familiar with the teacher, school and playground. If she was at the same school last year that will help ease her worries, but nerves may still kick in and it is advisable that you chat about the school routine and any differences that she may encounter during the year. Separation anxiety is common when starting school for both parents and children. It’s quite traumatic saying goodbye to an unhappy child. If your child does not want to separate from you, spend a little time with him in the classroom before leaving. For some parents it is difficult to leave a crying child with a teacher and you may be tempted to sneak off when your child is distracted. Always make sure you say ‘good bye’! It is important not to make endings something to avoid, as this impacts on how children will be able to cope with future endings or losses. Make sure that your child knows that you, or whoever is dropping them off, will come back. When you leave, tell your child where you are going and reassure him that they will not be forgotten and they will be thought about during the day and fetched later. If someone else is collecting your child from school, it is important that they know who this is and has met the person beforehand. Do not be alarmed if your seemingly happy child has an uncharacteristic meltdown during the first week of school. Chalk it up to stress, don’t be hard on them, and be sure to be there to talk about their big feelings so that they don’t have to resort to tantrums and acting out. It is always helpful when mom and dad can give a name to the confusing feelings that are going on inside of their little one. It is common – and often embarrassing – for small children to wet themselves at school, especially in the first few weeks. Children often don’t like using the school toilets or they become so involved with their play that they hold it in until it’s too late. It is advisable to pack your child a change of clothing to avoid any humiliation, should this happen. Remember that your child is still young and it is essential that she is happy at school. If you notice after the first week of school that your child hasn’t settled, don’t hesitate to contact the teacher. Explain that your child doesn’t seem to have settled in yet. Perhaps the teacher is unaware of this and needs to make a special effort to reach out so that your child is able to connect with the teacher and feel at home. Most teachers understand this issue and will pay extra attention to your child during that first week if you make a warm request. The social, emotional and academic development of children is an incredible process. Give yourself permission to trust your instincts as a parent. Ububele hopes that 2016 is a happy and meaningful year for you and your children.